The Mexican drug trade and its impact on the US has been documented in several films and shows from Steven Soderbergh’s Traffic (2000) and Ridley Scott’s The Counsellor (2013) to Breaking Bad and most recently Denis Villeneuve’s Sicario (2015). The sense of hopelessness in the face of almost unimaginable brutality powered by the logic of feral capitalism has also led to the exasperated hopelessness of No Country for Old Men (2007) and the exploitative nonsense of Oliver Stone’s Savages (2012). North of the border, vigilante Tim “Nailer” Foley patrols the hinterland with his growing band of assorted volunteers. Some are obvious racists, opportunists looking for a thrill, but all see the threat as real and apparent and, as Donald Trump has revealed, the fear is real. But the real story lies in Mexico and it’s in the Michoácan region that another group, the Autodefensas, has sprung up. Led by the charismatic Dr. Mireles, this white-haired physician seems to be a representative of the enraged civil society that we never see. A leader of obvious dignity and stunning courage, gently spoken and reasonable but with a steely determination. Mireles is almost too good to be true. His Autodefensas movement takes the war directly to the cartels. Ignoring the Federales police force who are hopelessly infiltrated and the corruption of the Mexican state, the citizens’ vigilante group motors into a town, evicts known cartel member – often recognisable from their gang tattoos – and then claims it as their own. By getting boots on the ground and using the same kind of violence against the cartels linked with a popular will to be rid of the gangs manifested in mass demonstrations, the Autodefensas has become a powerful force to be reckoned with. At one point the police turn up to disarm the group but a crowd soon gathers and with the situation rapidly getting out of hand the police back down and offer their congratulations. Whereas Nailer and his pals can be to some extent dismissed as fantasists and busy bodies, the popular anger at the cartels and the colluding state in Mexico cannot be so easily dismissed and vigilantism is more difficult to deny. We hear the testimony of victims of the cartels which includes sadistic torture and the most ludicrous violence. A local landowner refuses to pay protection money and a gang of his workers are executed. A young woman is forced to watch her family including her husband first tortured and then murdered before she herself is raped. She is allowed to live “because that will be your punishment” and yet when Heineman films the capture of the men responsible they are just ordinary looking blokes, and not the Tony Montana monsters. The hoary old ‘banality of evil’ cliché never seemed so sadly appropriate. 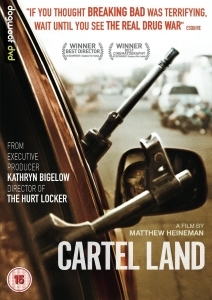 If Heineman’s Cartel Land was simply a straightforward snapshot of the status quo, it would already be a fascinating and incredible film. The scenes that the embedded reporter captures of fire fights and raids are as intense as anything from a war movie (Kathryn Bigelow has a producer credit). However, it is in the second half of the film that the film takes on an almost Shakespearean descent into the corruption that slowly spreads through the Autodefensas, the betrayals and the compromises. The heroic Mireles is beset not only by the cupidity of his own lieutenants, the enmity of the state and the cartels, but also by his own demons and temptations.